Western New York union members gathered outside of New Era Field Saturday to protest the closure of the New Era's Derby production facility. 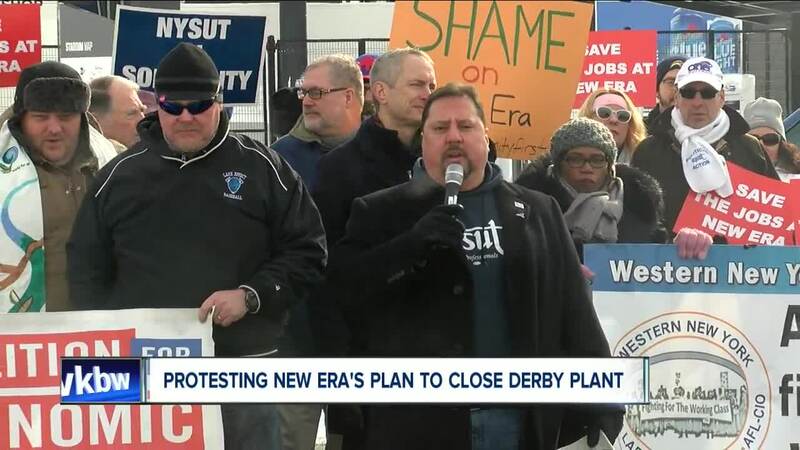 ORCHARD PARK, N.Y. (WKBW) — Western New York union members gathered outside of New Era Field Saturday to protest the closure of the New Era's Derby production facility . Members of the Western New York Area Labor Federation, the Lake Shore Central Teachers Association, joined by Assemblyman Sean Ryan, Congressman Brian Higgins and Coalition for Economic Justice Executive Director Rev. Kirk Laubenstein joined together for the #NewEraHatsOff rally. New Era's plans to close the Derby production facility would cut nearly 200 union jobs in WNY.